Want to watch the Big Brother Canada 5 live feeds but live outside of Canada? 4:45pm Bathroom – Neda & Dallas Dallas – I think I’m going to have to sell Dillon down the river. Neda – do it. Just do it. It worked with me last week. Dallas – its hurting me. Its putting a target on my name Neda. I wanted to have a meeting with the vets. Do you think the vets are still on board with the vets? Neda – yeah, I think so. Dallas – are you on board Neda? Neda – I’m on board with you. 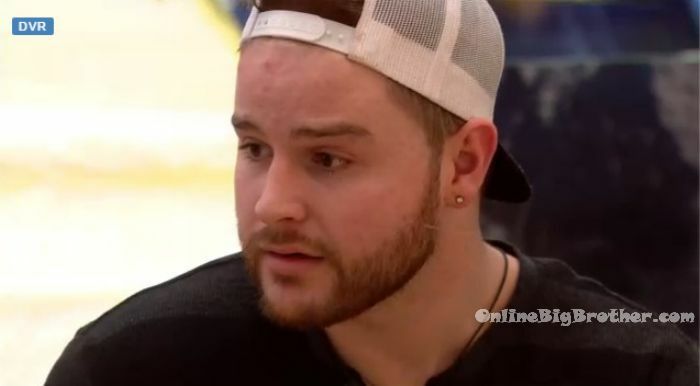 Dallas – I feel like I could have Jackie, I feel like I could have Cass.. You know how stressful that situation was for us last week.. you were crying and I was like what do I do?! And then I was like OK you know what, this is what I’m doing. And now I’m the bad guy for that. You know what I mean. I made an emotional move instead of a strategic move. Dallas – tomorrow before the POV ceremony kicks off I’m going to try and think of a good speech, a really good speech. I’m going to be real and authentic. Neda – just stay in the group situations. Don’t be hold up anywhere. You want to look as least sketchy as possible. Dallas – the whole thing with me getting close to Dillon was I wanted to have someone close to me so that if sh*t started getting stired up I would be able to tell. I didn’t know I had to check up with everybody ever f**king 20 minutes. Dallas – I feel like if Demetres is putting me up and if I needed six votes he would keep me… he would. He wants Emily out the door. If he keeps me I will have his back and keep him safe … I will go after Dillon. Neda – he’s one of those guys that appreciates loyalty. Neda – have you talked to Demetres? Dallas – he said as it stands now I am going up but that he wants to send Emily home. He said he has control over Jackie’s vote and the French Connection vote. He said you will get their votes. So it’s good in that way but people can say one thing and do another. He said straight up that he has to put me up. He said he can’t put up Kevin and Bruno because then there would be two people coming after him next week. As long as I can have a conversation with Kevin and the vets and be like lets bring this back in. Neda – yeah and that will make you feel a lot more secure once you have that. Dallas – I swear to god Neda, I will put them up in a f**king heart beat! Eight / five are good odds for the vets. I need to have a meeting tonight and be honest and sincere … and then before the veto ceremony drop a bomb. I don’t have a chance to fight for a veto and after I drop this bomb on Dillon I won’t have his vote anymore. Neda – this was not how the first two weeks of the game were supposed to go. Dallas – I know! You’re right. I like Dallas, but if the vets save him he will go for any of them first chance he gets. He is NOT loyal. He needs their votes and has promised not to vote against them. Then he goes to Dillon and said that they need to lay low for a few days, so I guess he has already lied to everyone. Thank you onlinebigbrother for recommending HMA really helped and for the updates. Are any more videos being uploaded? I know there was some late chats with class/ika/Demetres etc?